Fort Lauderdale, FL – The cost of gassing up kept going up during the past week, according to the U.S. Energy Information Administration. 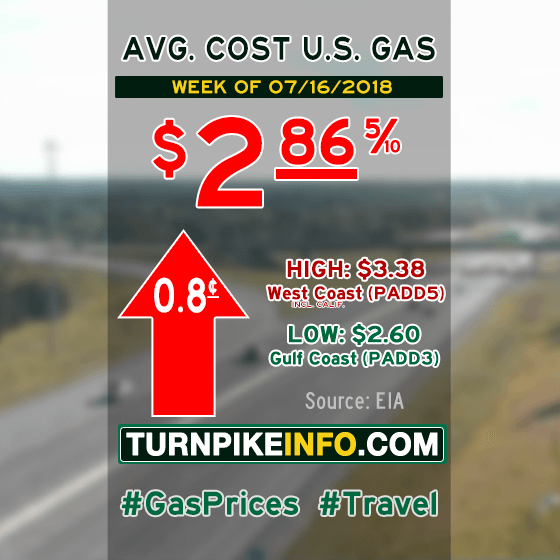 The E.I.A.’s weekly fuel price survey shows the cost of a gallon of regular unleaded gas notched upward about a penny per gallon to near $2.87. Prices were mixed from region to region, with the cost of gas remaining fairly static in the New England states. Drivers across the Rocky Mountains and West Coast enjoyed a mild dip in prices. But costs drove upward a dramatic four cents per gallon across the Lower Atlantic, where summer tourism is peaking across Florida, which is in the Lower Atlantic survey region. The cost of diesel fuel went down slightly for many truckers, according to the E.I.A. Nationally, the price remained at $3.24 per gallon, with only a four-tenths of a penny decline in prices. Prices slipped downward at a faster pace across the Rocky Mountains and the West Coast. This week’s average fuel prices for all regions are shown below, as gathered from www.eia.gov.